Investing can be quite boring – especially if one is following a long-term plan. From my experience, people who do it best are those who put their investing on an auto-pilot. And let their money compound over time. For 10, 20, even 30 years or more. Successful investing doesn’t need to be exciting. For that, we have life. I’ve previously written about my 20-year 401(K) investing journey here and my ongoing (18 years and counting) Roth IRA investment here. In today’s post, I present an account of my investing in a regular (not tax-sheltered) brokerage account. I had opened my first brokerage account at Charles Schwab in 1993. Back then, I really didn’t know a whole lot about investing in stocks. But I had a problem to solve. I had opted in to my employer’s stock purchase plan. I thought it was a good deal – they offered 15% discounted company shares. When my first tranche got vested, I found out I had to open a brokerage account to sell my shares. 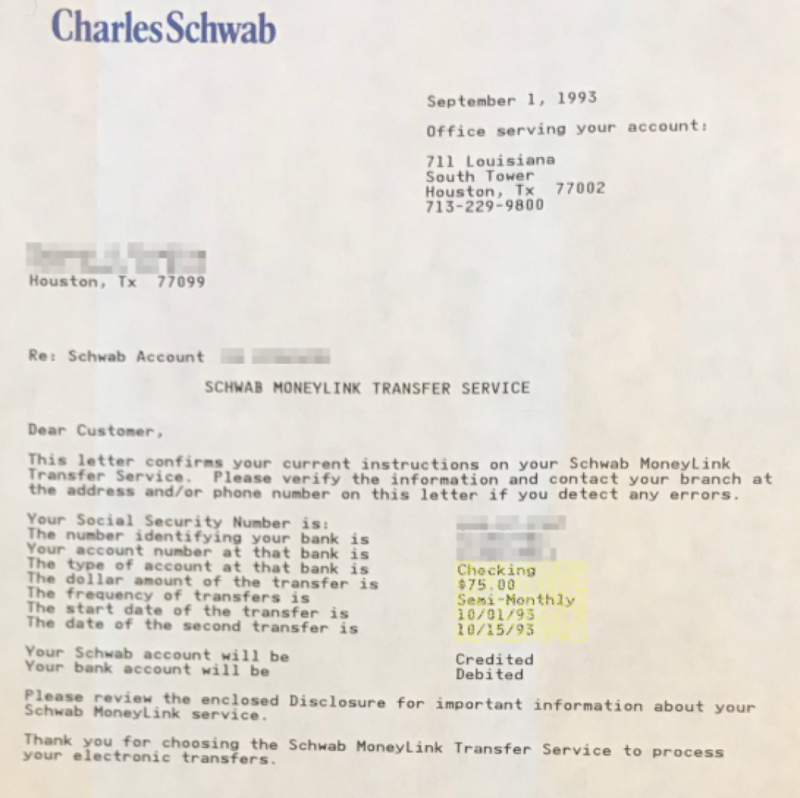 With Schwab, there were no minimums to open a brokerage account as long as I do a monthly money transfer into it. Minimum amount was $150 a month which I had them split into two transfers — $75 per paycheck. It wasn’t a big amount but still something to start with. I didn’t know where to invest this money. Early on, a lot of it went and stayed in a money market account. 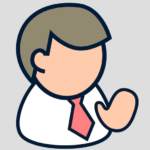 I also dabbled into some mutual funds and occasional stock purchases – mostly without a clear plan or good insight. By 1996, I had convinced myself that the best approach was to find a low-cost index fund to invest the money in. And then let it be on auto-invest. 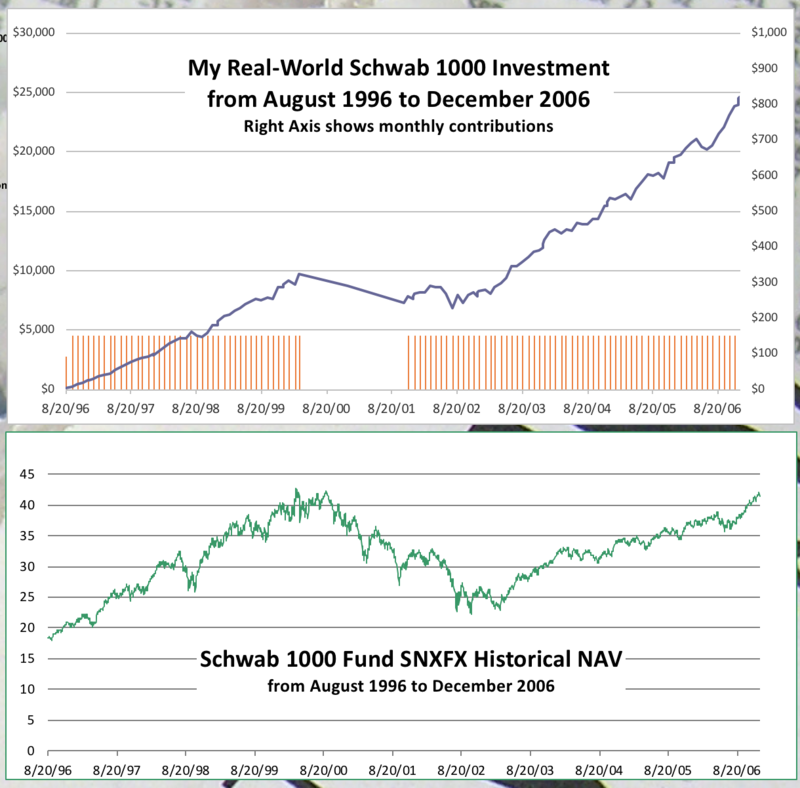 Schwab had an excellent candidate for me: Schwab 1000 (SNXFX) index fund. 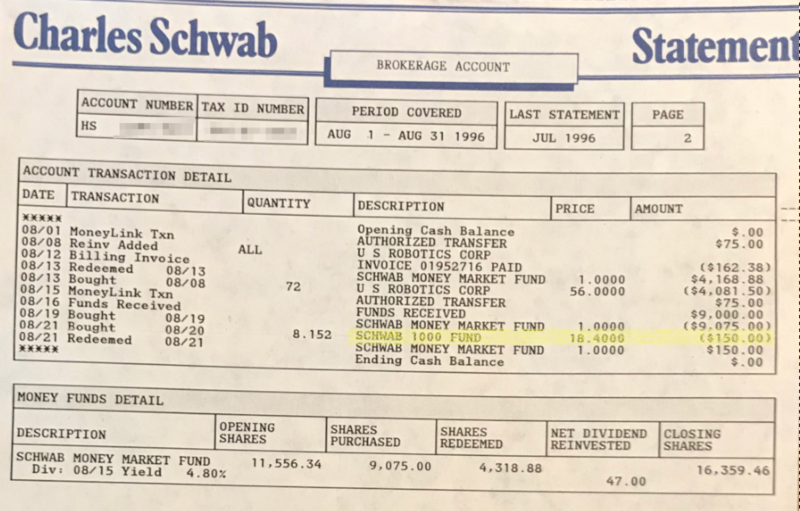 Started in 1991, it was, at the time, the lowest cost mutual fund available at Schwab featuring no-load, no transaction fee, and no minimum investment for its clients. It was a no-brainer investing decision. Investing Journey: In August 1996 as I had started putting those $150 at work every month, little did I know that the U.S. stock market would take a big tumble in less than five years. This would be my first bear market experience. I didn’t have an exit plan. I hadn’t thought about how long to keep investing and when to pull my savings out. I was about five years into my full-time working life. Retirement was furthest from my mind. There were two things driving my investing approach then: One, I had some excess money coming my way that I wanted to save. And secondly, I had read enough about investing to know not to keep it all in cash. And so began my 10-year odyssey with SNXFX. 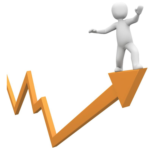 Dollar cost averaging into it every month for ten years – except for a brief hiatus in 2000. From 1996 to early 2000, stocks went up steadily. So did the SNXFX share price. Not quite at the blitzing pace of go-go 90’s technology stocks though. Remember this was an index built on top 1000 American companies; not all of them were in the technology sector. Still, I felt like I was on a roll. As the technology bubble burst in early 2000, the market took a decisive turn downhill. In March 2000, I stopped investing in SNXFX but kept the money transfer going. Instead, I used the incoming cash to get some exposure to international stocks. More on my international adventures in a future post. But as far as investing in SNXFX was concerned, I resumed my dollar-cost averaging into it in October 2001. Stocks dropped again in 2002 and then rose strongly in 2003. As stocks fluctuated, I remained steadfast with my auto-investing plan. The ensuing three years saw stocks steadily rising – recovering most of the losses. By the end of 2006, SNXFX was back to its prior peak established in March 2000. It felt like I was made whole again. By this time, I was ready to move beyond just being a passive indexer. I had become interested in analyzing and owning businesses. I needed capital to invest in individual stocks. So starting in 2007, as part of my gradual shift from passive index funds to individual stocks, I decided to pull the plug on SNXFX – ending my 10-year journey on a high note. You can see from my portfolio that many of my individual stock positions were established in 2007 and later. Results: So how did I do over that 10-year period? Not too bad, considering that I went through a bear market. One major factor was that I had stayed invested. The graph below shows the progression of my SNXFX investment over the period. Note the 18-month gap in monthly contributions in 2000 – 2001. Considering the 18-month period where I didn’t invest, in total I invested $15,841 in the index fund. I also reinvested dividends and capital gain distributions. Total value by the end of the year 2006 was $24,567. My annualized rate of return of 8.4%. Pretty good return for a period that featured a full bear market. Total gains amounted to $8,725. At first blush, you might be thinking that most of those gains were due to the stocks’ initial rise from 1996 to 2000 – before the onset of the bear market. Take another look at the previous chart. I actually made more money when stock prices rose from the depth of the bear market beginning in March 2003. As I said in the beginning, long-term investing can be a boring affair. But if you do it right, it could be quite profitable too. I still have that twice-a-month money transfer going on into my Schwab account. $75 at a time. For 25 years and counting. It’s a small amount in today’s world. It’s no longer meaningful to my investing but I’ve kept it going. Why change something that had served me well. I no longer use the money to buy index funds though. I focus mostly on buying shares in individual businesses. In my next week’s post, I will write more about my investing returns and analyze some what-if scenarios. What if I had not stopped investing for those 18 months? What if I had started investing in March 2000 – near the peak of the bull market? Stay tuned. « Don’t take investing advice from people you don’t know!